When was the last time an all-rock open air event was seen in the Steel City?! Way back in 1993 when Def Leppard, Thunder, Ugly Kid Joe and Terrorvision played to over 40 000 people at the now demolished Don Valley Stadium. 25 years later, rock is back in the Don Valley – not at the stadium but at the Bowl, an 8000 capacity grass bowl that will become home to the very first Rockin the Bowl full day event. 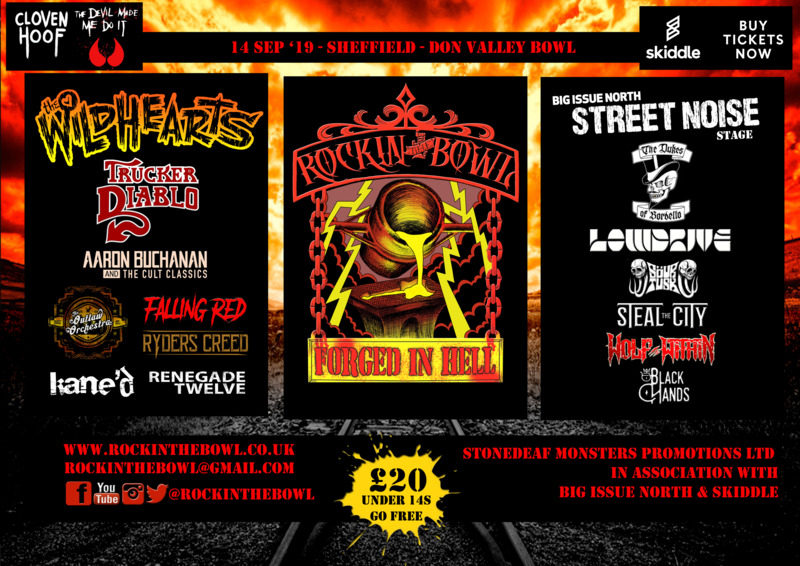 As a nod towards Sheffield’s proud industrial heritage, this year’s party will be ‘FORGED IN HELL’ and will be featuring a great line-up of local and national rock bands. There is so much out there today. It’s impossible to choose but we reckon we were lucky enough to grab a great bunch that will guarantee you one of the parties of the year. Grab a beer or a brew and have a good old rummage around our website and check out all the stuff we got for you. Just remember, if it’s Rock n’ Roll but it’s not on here – all that means is it’s not on here YET! Cheers for supporting the next wave of British Bands that will be carrying the banner and making sure Rock will never die.